Welcome! We celebrate the diverse community that we live in and serve, and hope to demonstrate that on stage and behind the scenes. 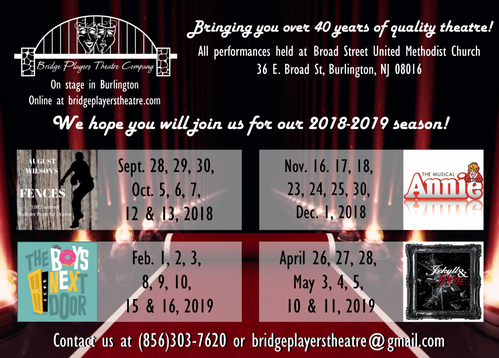 If you're looking for a place to enjoy live theatre in New Jersey we invite you to join us at Bridge Players Theatre Company. In 2018 and 2019 we invite you to dream! In September we see the unfortunate side effects of dreams that have been broken with August Wilson's heart wrenching play Fences. The Pulitzer Prize and Tony-Award winning play captures the angst of a man who sees his dreams shatter and the toll it takes on his entire family. In November, we celebrate the holidays and get to see new dreams realized for the adorable orphan named Annie who wants a home and family to call her own. In February 2019, we invite you to see Tom Griffin's The Boys Next Door and meet four mentally challenged men who live in a communal house and share simple dreams of having love, laughter and the desire to find some meaning and purpose in life, like everyone else. NEW SHOW: We end our season in May with All Night Strut! Who doesn't love great music that will make you tap your feet and dream about dancing the night away. Up Next: The All Night Strut! Get notices about auditions, shows and special events and receive our monthly newsletter. Be in the know about Bridge Players!